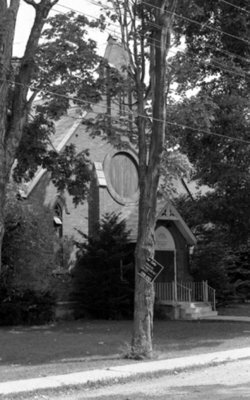 A black and white photograph of St. John the Evangelist Roman Catholic Church located at 508 John Street West. St. John the Evangelist Roman Catholic Church was built in 1902-1903 at the north east corner of Palace Street and John Street. It served as a church from 1903 to 1959, as a public hall (known as the Amber Room) from 1959 to 1974 and as a private residence from 1976 onwards. It was built on the site of a previous Catholic church which was built in 1867, and destroyed by fire during December 1901. St. John the Evangelist Roman Catholic Church, July 1975, Brian Winter. Whitby Archives A2013_004_034C.